So apparently, Tintin’s Adventures has inspired readers all over the world except for America. Steven Spielberg’s goal was to open the minds of Americans to the book of comics by Herge.Well, I’m not sure if he succeeded or not. You see, I have never read the books, unlike my eight-year-old brother. I had to rack my brains to follow the plot – there was too much dialog instead of telling the story. Captain Haddock’s voice was often slurred with whiskey, making comprehension hard. The action scenes were placed into the story a bit choppily and were often unbelievable – but overall, The Adventures of Tintin had a pulse that kept my eyes riveted on the screen. Tintin is a boy reporter who seems to be living all alone with his faithful dog, Snowy. He purchases a model of a mysterious ship – the Unicorn – and is approached by mysterious vagabonds from all sides. He finds himself on a wild adventure with the last Haddock alive to figure out where the multitude of treasure lay at the bottom of the sea. As I said before, I have never read the books, so I cannot say if the film stayed true to the characters and plot. Even so, I thought Tintin and the antagonist, Sakharine, were especially well done and brought to life. Haddock… not so much. If Tintin had not been so patient with the incoherent Haddock, I would have probably hated him. Oh yes, whiskey is ever-present from the moment Tintin meets Haddock. The Captain constantly talks about whiskey, and parents may want to talk to their kids that drinking whiskey does NOT bring back lost memories. The flashback to the fight between Haddock and Sakharine’s ancestors gave me a flashback to Pirates of the Caribbean. I honestly thought the man in the red cape was going to reveal himself as Jack Sparrow instead of the Red Rackham. 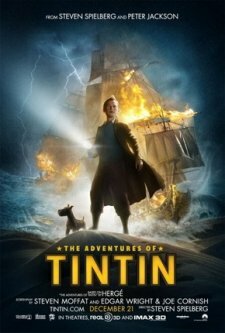 The Adventures of Tintin is action-packed, exhilarating, and extremely exciting. It has many invigorating scenes and visuals. In this adventure, Tintin has to find the three ships and scrolls, to figure out the secret of the Unicorn. Soon, Tintin gets captured on a ship and meets Haddock, who is the captain of the ship. They both escape together and go on a wild adventure followed by Sakharine. Sakharine is the main bad guy in this movie, though there are others. This movie is really great, but if you didn’t read the book you wouldn’t understand the plot. I think that the coolest scene in the movie is when they are escaping the ship through a hail of gunfire, outruning murderous sailors, and continueing with their swashbuckling and riproaring adventure. Even though the movie is a little violent, it is magnificent for adventure-loving kids. I loved the mocap – the realism was amazing. It is mind capturing and I think this is the best animation I ever saw! It makes me want to read all of the Tintin books. I rate this fabulous movie 4 stars, and a Pick It! Copyright © 2011-2017 Cassandra Hsiao retains sole copyright to her contributions to this blog. Enter your email address to subscribe to this blog and receive notifications of new posts by email. An email will be sent to your inbox confirming your subscription.